We should probably think this the most beautiful of ducks, were the Wood Duck not around. His rich glossy-green head and neck, snowy white collar, and curly feathers of the tail are surely marks of beauty. But Mr. Mallard is not so richly dressed all of the year. Like a great many other birds, he changes his clothes after the holiday season is over. When he does this, you can hardly tell him from his mate who wears a sober dress all the year. Most birds that change their plumage wear their bright, beautiful dress during the summer. Not so with Mr. Mallard. He wears his holiday clothes during the winter. In the summer he looks much like his mate. Usually the Mallard family have six to ten eggs in their nest. They are of a pale greenish color—very much like the eggs of our tame ducks that we see about the barnyards. 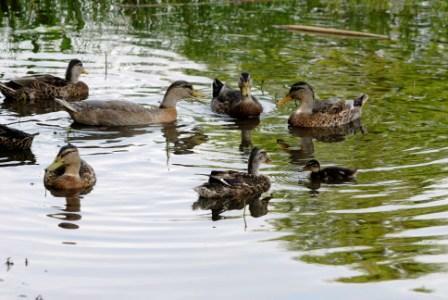 Those who have studied birds say that our tame ducks are descendants of the Mallards. If you were to hear the Mallard’s quack, you could not tell it from that of the domestic duck. The Mallard usually makes her nest of grass, and lines it with down from her breast. You will almost always find it on the ground, near the water, and well sheltered by weeds and tall grasses. It isn’t often you see a duck with so small a family. It must be that some of the ducklings are away picking up food. Do you think they look like young chickens? From col. Chi. Acad. Sciences. 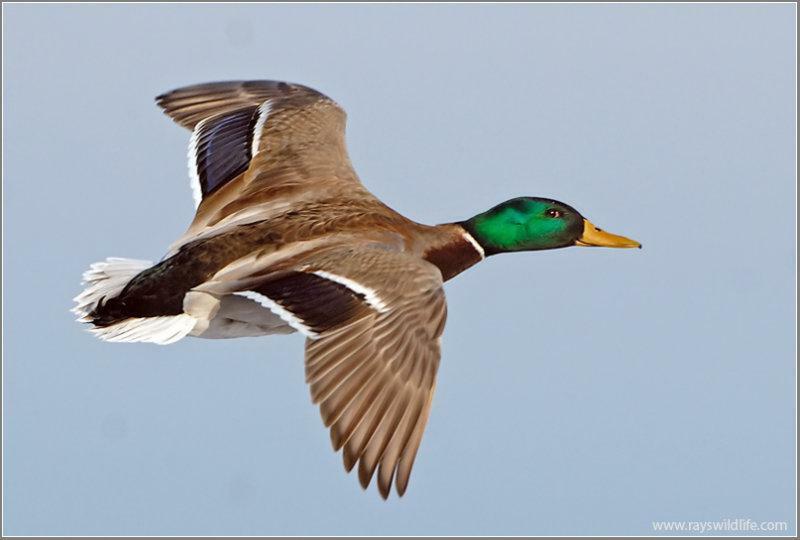 HE Mallard Duck is generally distributed in North America, migrating south in winter to Panama, Cuba, and the Bahamas. In summer the full grown male resembles the female, being merely somewhat darker in color. The plumage is donned by degrees in early June, and in August the full rich winter dress is again resumed. The adult males in winter plumage vary chiefly in the extent and richness of the chestnut of the breast. 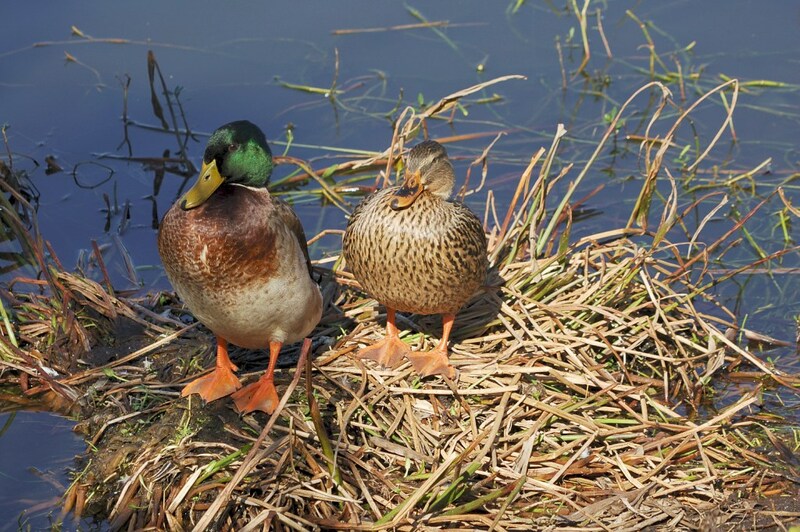 Early in spring the male and female seek a nesting place, building on the ground, in marshes or among water plants, sometimes on higher ground, but never far from water. The nest is large and rudely made of sedges and coarse grasses, seldom lined with down or feathers. In rare instances it nests in trees, using the deserted nests of hawks, crows, or other large birds. Six or eight eggs of pale dull green are hatched, and the young are covered over with down. When the female leaves the nest she conceals the eggs with hay, down, or any convenient material. As soon as hatched the chicks follow the mother to the water, where she attends them devotedly, aids them in procuring food, and warns them of danger. While they are attempting to escape, she feigns lameness to attract to herself the attention of the enemy. The chicks are wonderfully active little fellows, dive quickly, and remain under water with only the bill above the surface. On a lovely morning, before the sun has fairly indicated his returning presence, there can be no finer sight than the hurrying pinions, or inspiring note than the squawk, oft repeated, of these handsome feathered creatures, as they seek their morning meal in the lagoons and marshes. MALLARD DUCK.—Anas boschas. Other names: “Green-head,” “Wild Duck.” Adult male, in fall, winter, and spring, beautifully colored; summer, resembles female—sombre. Range—Northern parts of Northern Hemisphere. Nest—Of grasses, on the ground, usually near the water. Eggs—Six to ten; pale green or bluish white. Wikipedia says,The Mallard or Wild Duck (Anas platyrhynchos) is a dabbling duck which breeds throughout the temperate and subtropical Americas, Europe, Asia, and North Africa, and has been introduced to New Zealand and Australia. This duck belongs to the subfamily Anatinae of the waterfowl family Anatidae. The male birds (drakes) have a bright green head and are grey on wings and belly, while the females are brown all over. 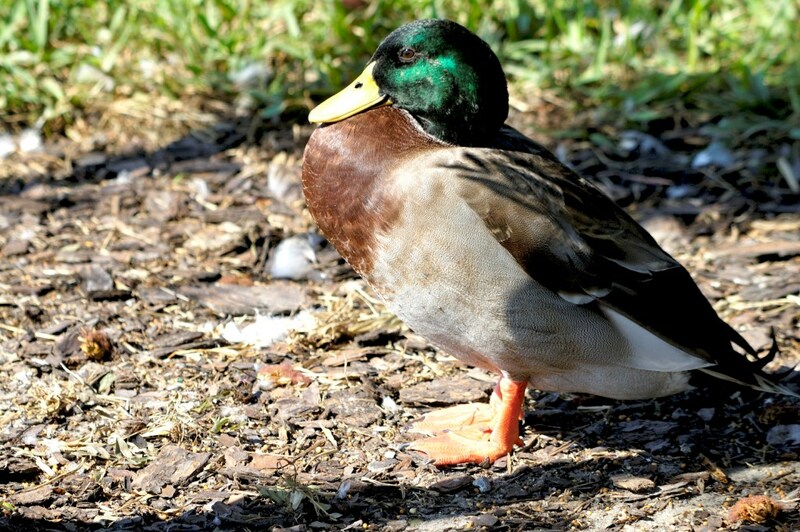 Mallards live in wetlands, eat water plants and small animals, and are gregarious. 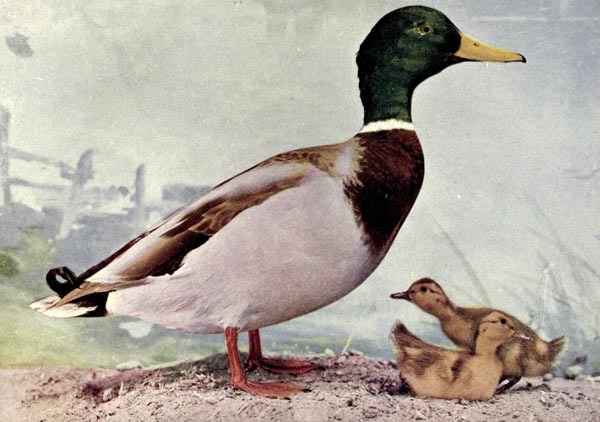 This species is the ancestor of almost all of the breeds of domestic ducks (Aflacs etc). The Mallard is 50–65 cm (20–26 in) long (of which the body makes up around two-thirds), has a wingspan of 81–98 cm (32–39 in), and weighs 0.72–1.58 kg (1.6–3.5 lb). The breeding male is unmistakable, with a bright bottle-green head, black rear end and a yellowish orange (can also contain some red) bill tipped with black (as opposed to the black/orange bill in females). 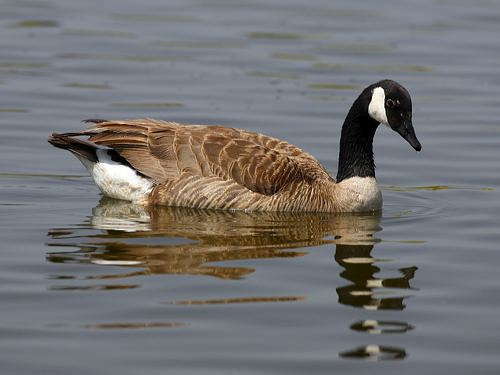 It has a white collar which demarcates the head from the purple-tinged brown breast, grey brown wings, and a pale grey belly. The dark tail has white borders. The female Mallard is a mottled light brown, like most female dabbling ducks, and has buff cheeks, eyebrow, throat and neck with a darker crown and eye-stripe. However, both the female and male Mallards have distinct purple speculum edged with white, prominent in flight or at rest (though temporarily shed during the annual summer moult). Upon hatching, the plumage colouring of the duckling is yellow on the underside and face (with streaks by the eyes) and black on the backside (with some yellow spots) all the way to the top and back of the head. Its legs and bill are also black. As it nears a month in age, the duckling’s plumage will start becoming drab, looking more like the female (though its plumage is more streaked) and its legs will lose their dark grey colouring.